Football Association chairman David Bernstein says the search for a new England manager is being undertaken with the "greatest urgency". On Friday, FA general secretary Alex Horne said a new boss would not come until the "back end of the season". "Under no circumstances should our taking time be seen as anything other than dealing with it professionally and urgently," said Bernstein. A shortlist - of more than three, but fewer than 10 - is being considered. 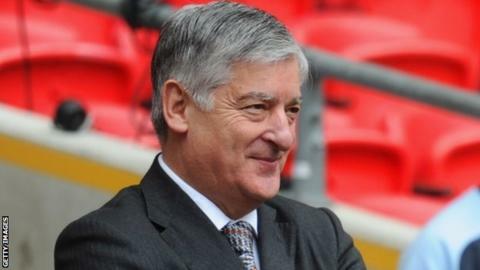 The FA's Club England board - Bernstein, Horne, Trevor Brooking, and Adrian Bevington - will cut down the shortlist and recommend one name to the full board. At least one name on the target list is understood to be an overseas coach. On Sunday, former England captain Terry Butcher called the FA's search for a new boss "a farce". But Bernstein countered: "We don't believe rushing this process is going to be good for arriving at the right conclusion. We are also doing this treating clubs and managers with the greatest of respect, we don't want to disrupt the season of the clubs. "Most of the people we are looking at are in positions and whatever we do we ought to try and do it in a way which enables clubs to finish their season with the minimum of disruption. "We have now arrived at a number of target names, I would call it a flexible target list because it's not absolutely fixed in stone and we will react to events depending how they unfold." It is understood to be unlikely that there will be any formal interviews for the post, and the preferred candidate will be selected by meetings and negotiation. Regarding the timing of any announcement, Bernstein agreed with Horne's assessment, but also conceded that an appointment could come sooner than the end of the season. "We would intend to deal with this at the back end of the season but it could be earlier, if certain things fell into place and the key appointment came, it could be earlier," continued Bernstein. "Our next step is to narrow that target list down to a very small number of key people who, of course, we believe actually want the position." Bernstein does not believe that the vacant manager's position at Chelsea - following the sacking of Andre Villas-Boas - will hinder the FA in their search to find the best candidate for England. "This position is so unique that the right person would want to do it on a sensible basis and for the right reasons," he said. "It is a very fluid situation, I am not sure if (other clubs searching for managers) helps or hinders. It depends on how the cards fall." He added speculation about possible candidates from anyone other than the four members of the Club England board were "lacking authority". It is understood the views of some highly regarded figures within the game have been canvassed, but no names have been openly discussed by the FA.